What is the Certificate of financial reliability? In the process of developing our models for the assessment of creditworthiness, we at the Prva bonitetna agencija, d.o.o., developed a model which, based on the data from financial statements and other publicly available business information, selects those economic entities for which the probability that in a period of one to two years there will appear any signs of impairment of their solvency, is negligible or virtually nil. They finance their business operations with the respective share of their own capital and have such a structure of assets and liabilities regarding their maturity that the latter assures their liquid current business operations and constitutes proper assurance of their solvent financial situation in the future medium-term period. Existing and future business partners of Certificate holders may assume with high level of probability that the latter in the future short-term period of at least one year shall not be subject to any circumstances which would under the Financial Operations, Insolvency Proceedings and Compulsory Dissolution Act (ZFPPIPP) claim the initiation of any insolvency proceedings proceedings or which would suggest a significant deterioration in their solvency. In the first three years 0,122%. For more than 2 days in the entire first year is 0,76%. Why is it useful to obtain the Certificate? 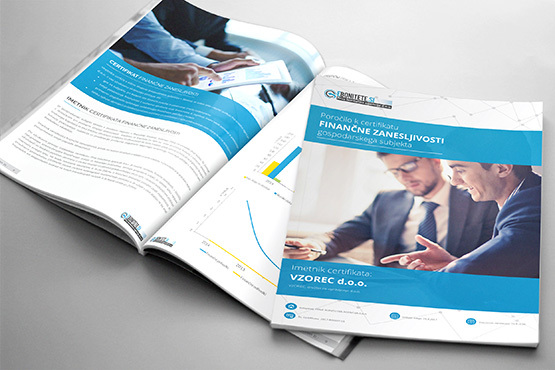 Past experience in the field of payment habits and many insolvency proceedings in which creditors are losing their assets, create a general atmosphere of business mistrust in the Slovenian economic area and force all economic entities to a high degree of caution when concluding business transactions. Therefore it can be very useful for all economic entities, even for the best, that an independent rating agency assesses and confirms their excellent financial health. As a Certificate holder you demonstrate to your business environment your independently certified financial status as a reliable economic entity. Your existing and future business partners may assume with high level of probability that you are a financially stable and reliable partner. 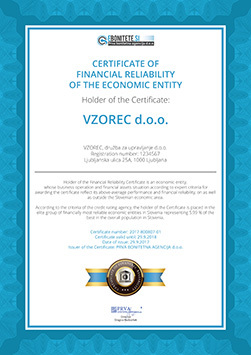 With the ownership of the Certificate you show your business partners that you belong to an elite group of Slovenian economic entities for which the probability that in a period of one to two years there will appear any signs of impairment of their solvency, is negligible or virtually nil. Who can obtain the Certificate? 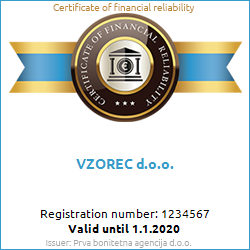 Prva bonitetna agencija, d.o.o., issues the Certificate in accordance with the General terms and conditions of issuing the Certificate of financial reliability which also contain the criteria for obtaining the Certificate. In accordance with the General terms and conditions of issuing the Certificate of financial reliability we as the issuer carry out an assessment if the client meets the criteria for obtaining the Certificate. If this is not the case, the client does not bare any costs of the assessment. 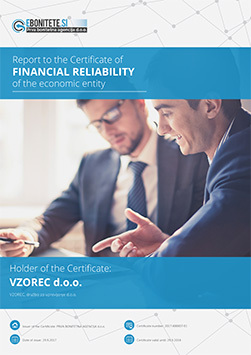 a Report to the Certificate in form of a document and/or in electronic form containing data about the Certificate, the Certificate holder, his business operations and the criteria, which he met for obtaining the Certificate (available in Slovenian and English). * It is mandatory to order one of the two options under category I. - Assessment and issue of the Certificate. ** In the case of ordering the options under category II. in both languages, the subscriber is entitled to a discount of 25% on the price for the options in category II. All prices are in €. VAT is not included. 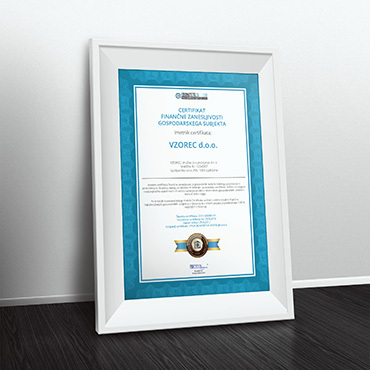 To order a certificate please complete and sign the order and send it to us via e-mail (info@ebonitete.si) or by mail (address: Prva bonitetna agencija, d.o.o., Podružnica Limbuš, Limbuška cesta 2, 2341 Limbuš, Slovenia). In case you would only like to check if you meet the criteria for obtaining the Certificate of financial reliability, please send us an assessment order.